For Just 81 Cents a Day! ✓ Yes, Tim! I want to become a Charter Member of your revolutionary income advisory service, Cabot Dividend Investor, and receive access to your proprietary Individualized Retirement Income System (IRIS). • Complete access to our proprietary IRIS income generating system that not only identifies Wall Street’s safest high-yield, high-growth stocks but also helps you organize your holdings into a powerful rising income-producing portfolio that’s right for you. 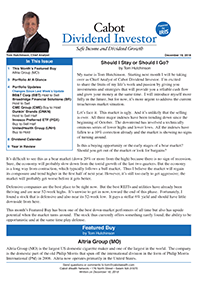 • Our monthly market update that will bring you a panoramic view of what’s going on in the market, how it affects our investments, along with our complete buy, hold, and sell recommendations. • Weekly news updates and flash alerts on the stocks that we own along with any adjustments we’re recommending for your portfolio. • 24/7 access to our private Dividend Investor website, reserved exclusively for Cabot Dividend Investor Members containing our most recent issue and alerts, your FREE special reports and forecasts, and our archive of our past issues and reports that you can always access with the click of a mouse. • Personalized Customer Service. Should you have any questions concerning IRIS, our recommendations, or portfolio adjustments, we will be here to take your calls every day the market is open from 9 am to 5 pm Eastern time. • Continuing Retirement Investor Education Series. Upon joining you’ll instantly receive these three free reports: Cabot’s Complete Retirement Income Guide—How to Secure a Life of Income, Everything You Should Know About Master Limited Partnerships Before You Invest a Dime, and Creating The Perfect Portfolio: Tips, Tricks and Strategies for making IRIS work for you. • PLUS a complete refund if you’re not 100% satisfied with your results in the first 30 days. If you join us on a monthly basis, and then wish to terminate your membership we will do so before the next monthly charge.